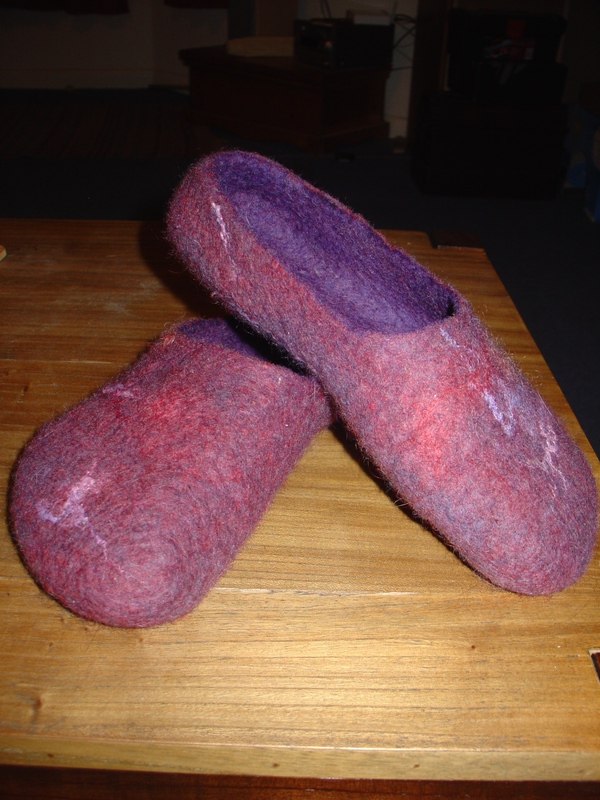 They are made using dark purple merino tops and red and purple carded Finn. There are 7 or 8 layers. To be honest I lost count amid all the rubbing and rolling and laying. 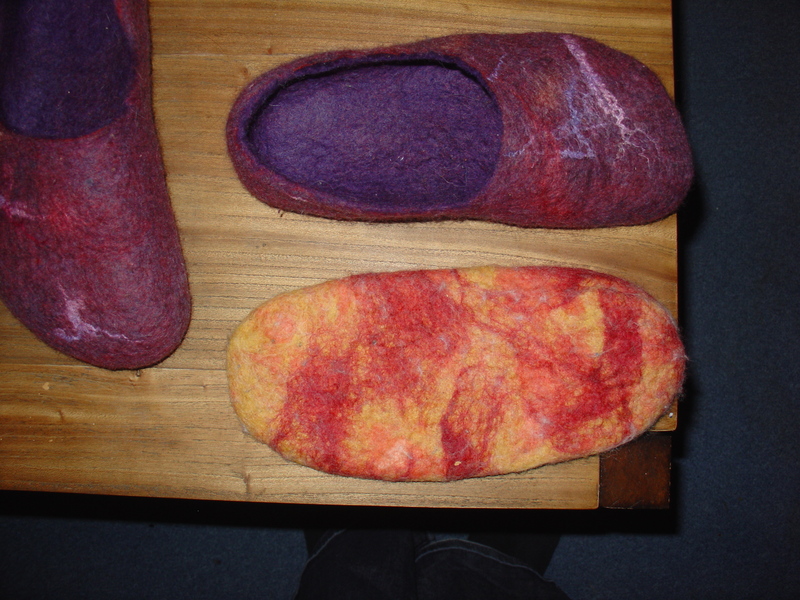 I added a little purple silk top and orange/red Wensleydale to the final layer to add a bit of interest…watch this space for photos. 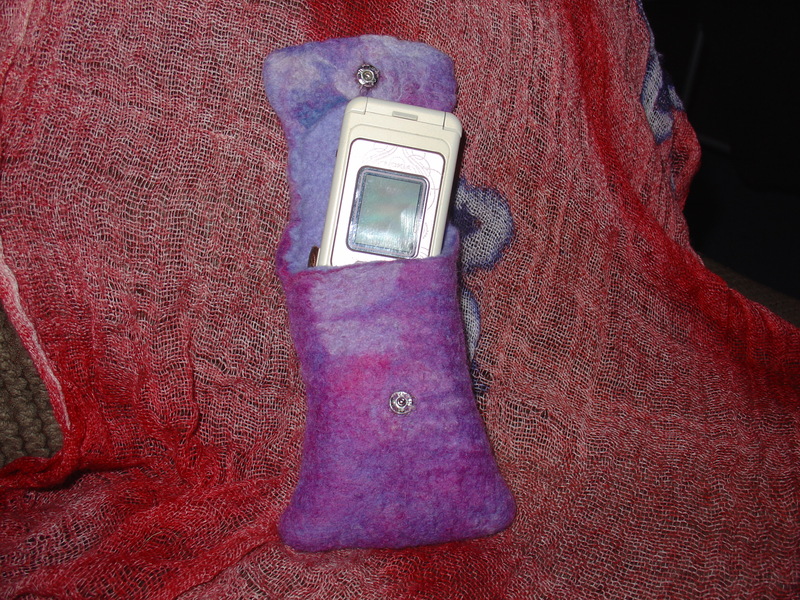 The day after I made the reversible wet felted bag I made a mobile phone case. 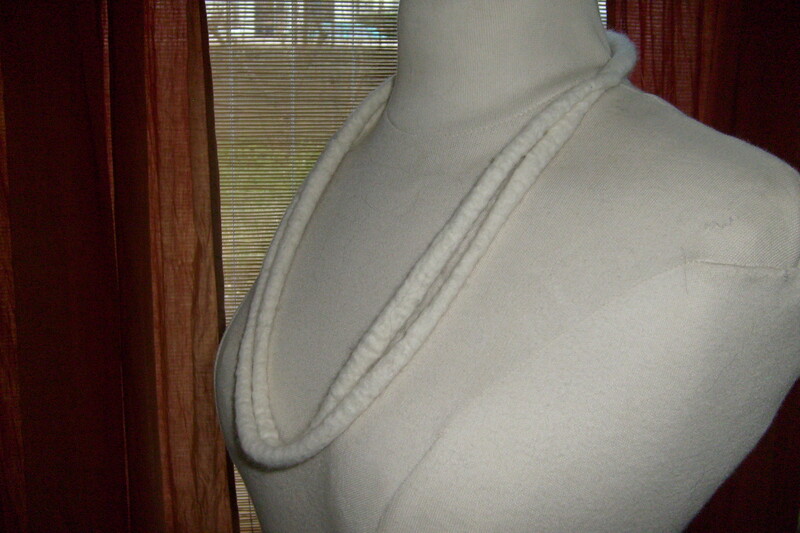 It was made using the same Corriedale tops as the handles in the bag. 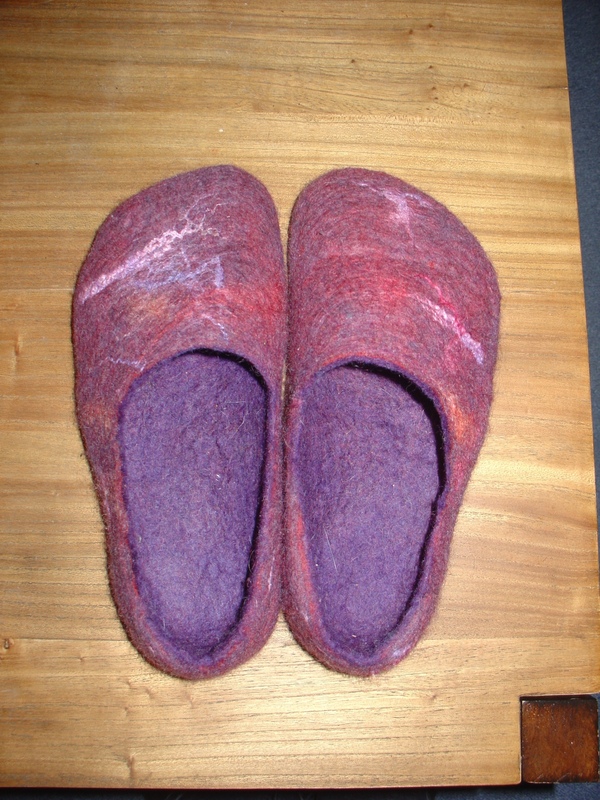 It was a beautiful blend of colours so has achieved a really nice effect. 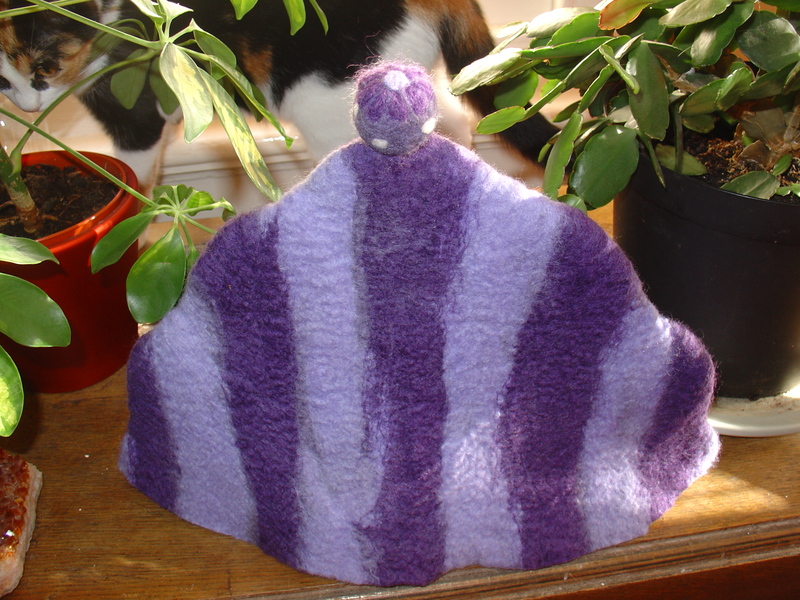 I felted it around a form but wanted it to be a bit ‘wobbly’ so made the bottom of the template curved. 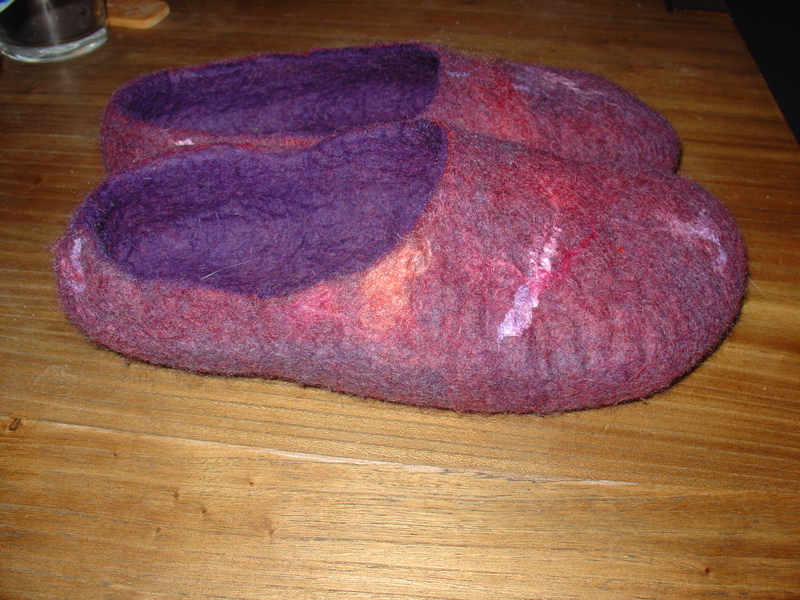 Although I don’t believe it was necessary I felted the flap using the resist too. I only wanted it to be half the thickness of the rest of the case (in order that it would be flexible enough) so only laid half the amount of fibre. Phone with its case - sturdy enough to prop the phone up with! 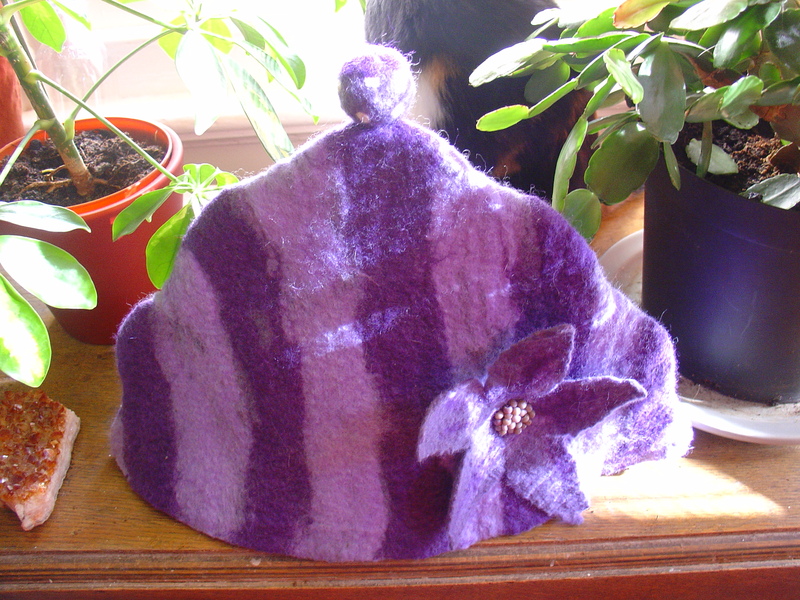 After the felt had dried I attached some pink and purple glass beads in a kind of star/flower pattern. 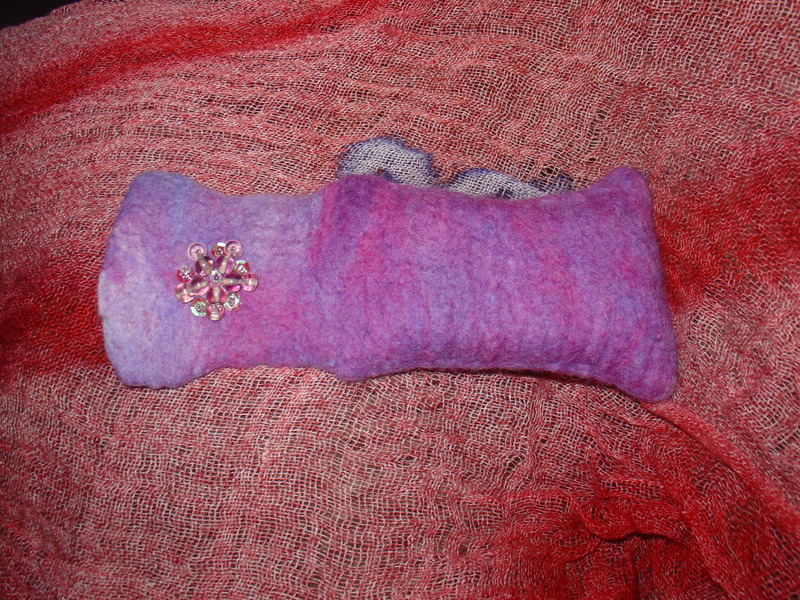 I then added sequins with pink seed beads between the pink beads. 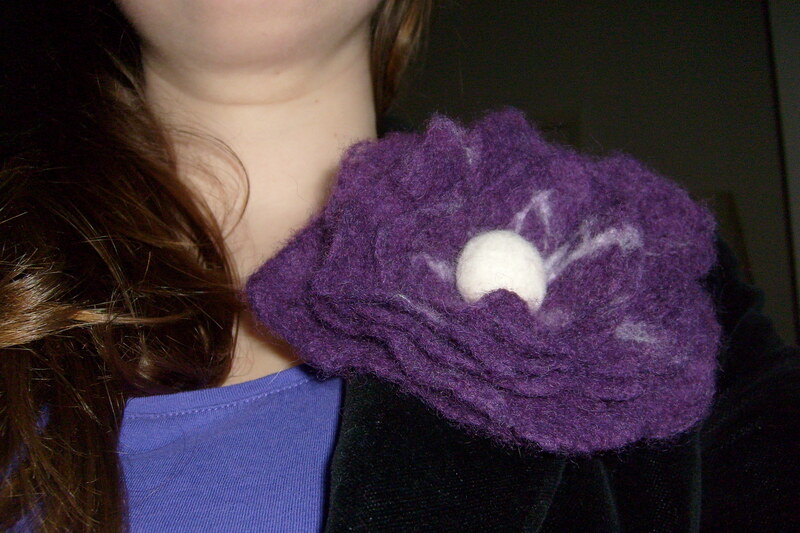 It still needed something so I added a final sequin in the centre with a purple seed bead to hold it in place. I then attached the popper. 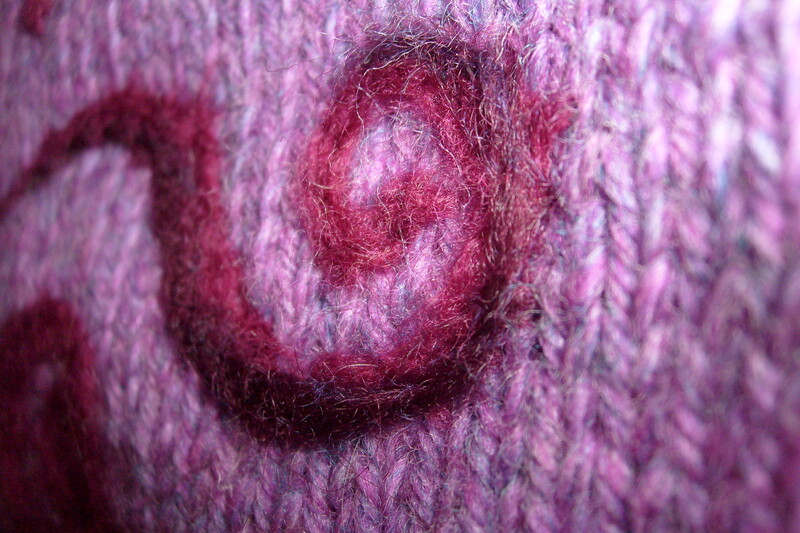 I didn’t go all the way through the felt. 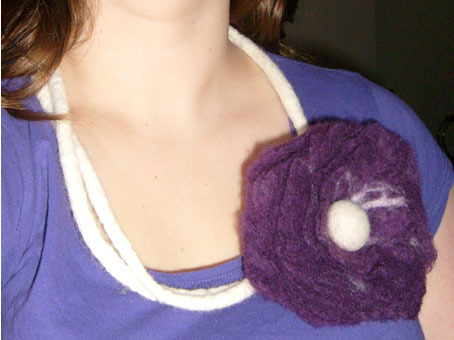 This was actually because the felt was so thick and rigid that I couldn’t turn it inside out to go all the way through. I’m glad that I did it this way and will continue to do so. 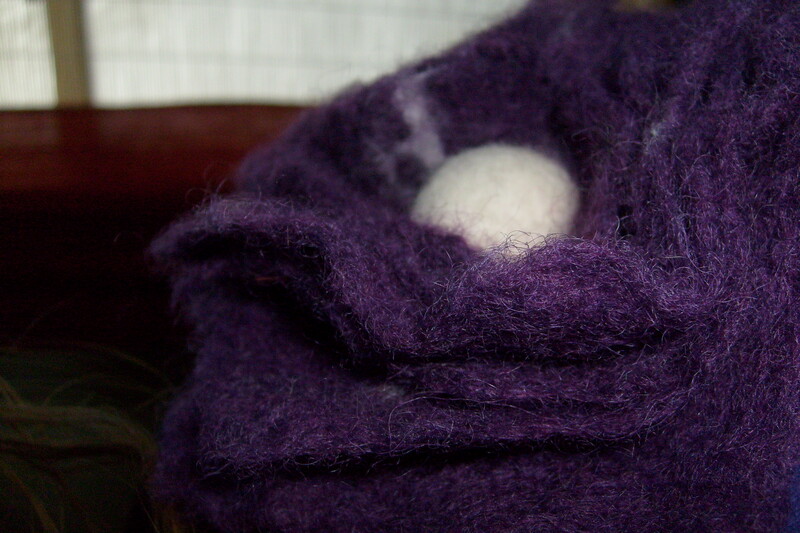 My poppers always wear out way before whatever they’re holding together so I used a lot of stitches to secure them. All in all, I like it and I think my phone does too! 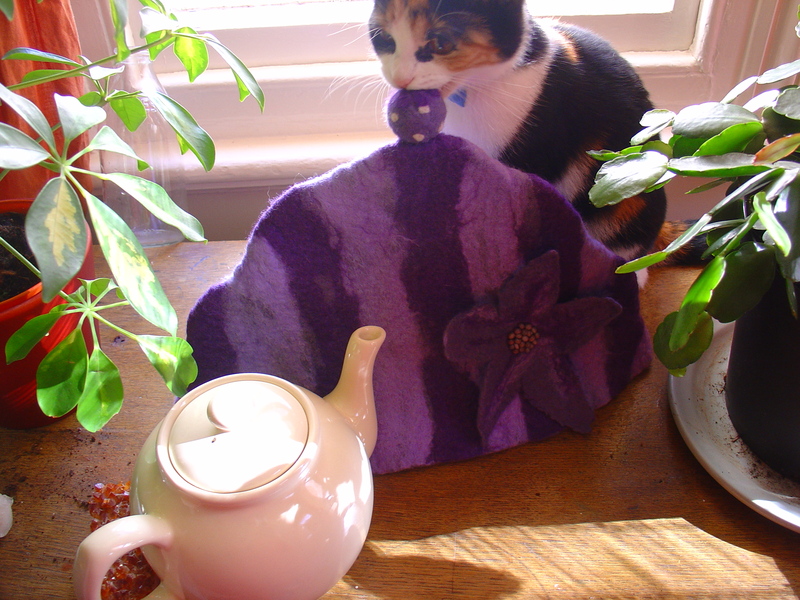 I now have the promised photos of my latest felted items. The light quality isn’t great but I lost my patience and just couldn’t wait for some good weather! Firstly, the bag! 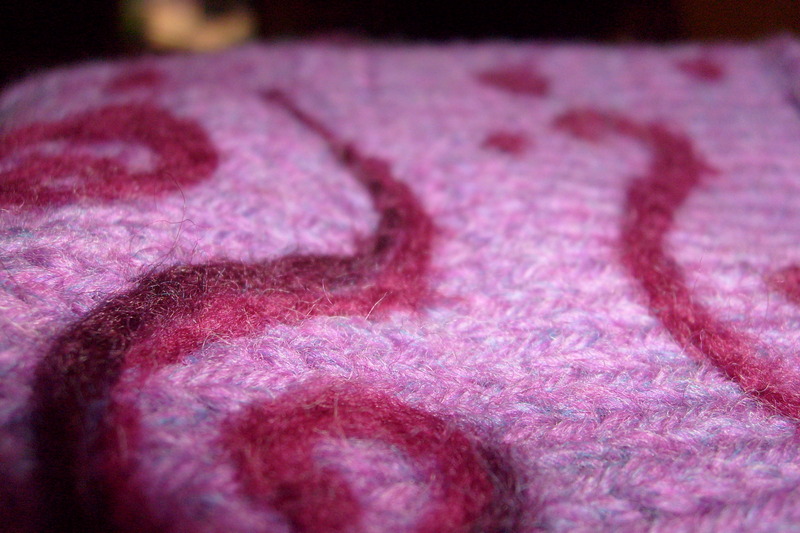 (See https://fortheloveoffelt.wordpress.com/2009/09/15/reversible-wet-felted-bag/). 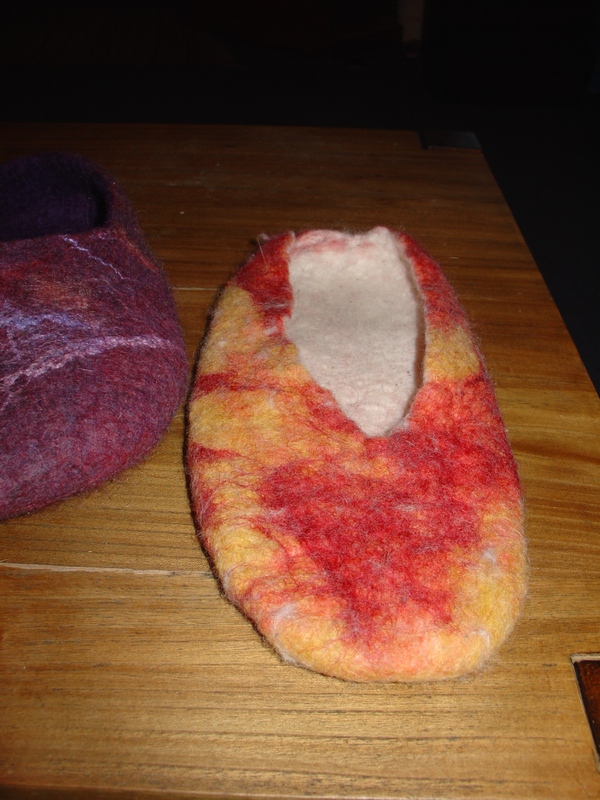 Here are the handles from the Reversible Wet Felted Bag, before I’d corrected the badly felted twist. 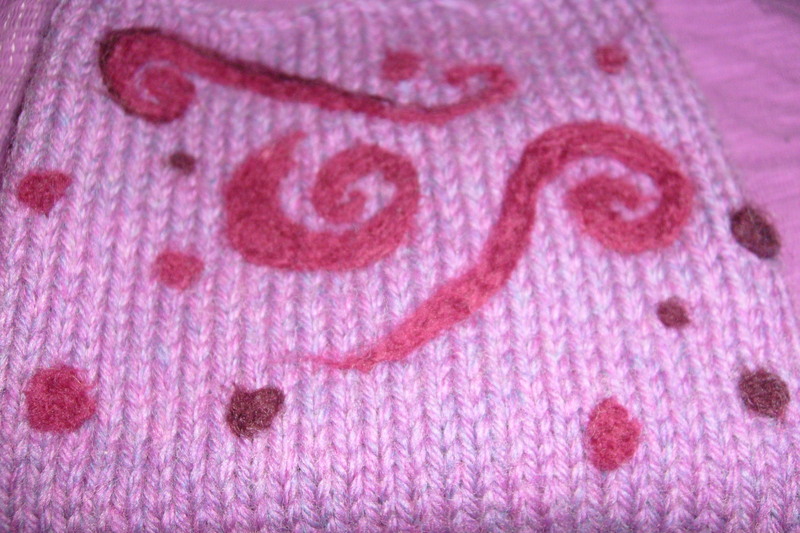 Here is the second part that didn’t turn out as expected, the 3 unsuccessful dots. Read the original post to find out why this happened. Faint dots in top right of image. I wore it for the first time on Saturday with the dots on the outside. 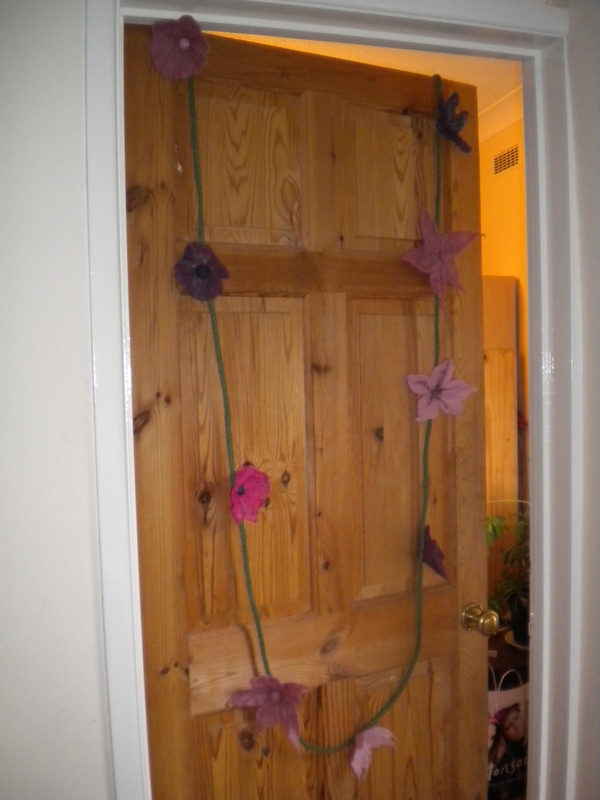 I was concerned that I should have put the knots of the handles on the outside so as to stay out of the way. It was fine though, and I had way more in the bag than in these pictures!